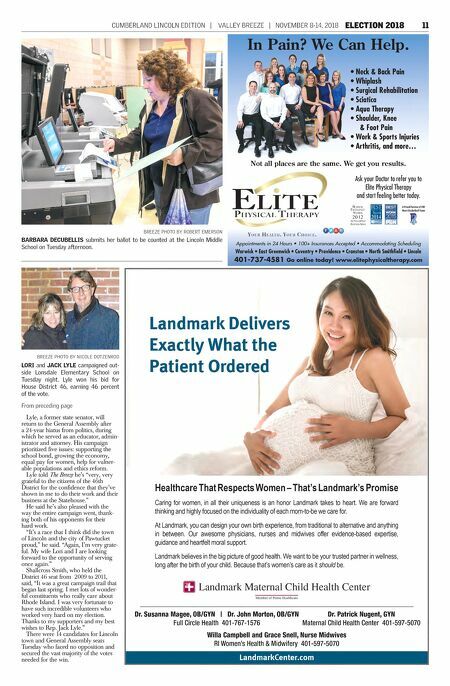 10 ELECTION 2018 NOVEMBER 8-14, 2018 | VALLEY BREEZE | CUMBERLAND LINCOLN EDITION or 48.2 percent. Another election will take place in two years – 2020 – at which time those elected will begin serving four-year terms. Officials had said that while com- bining the three offices in a four-year question on the November ballot might lessen its chances of passing, they felt it was the fairest route forward instead of separating them out for votes. Kinch, who had vehemently opposed going to four-year terms, said he was "overwhelmed, honored, and humbled" to win a seat. Celebrating at J Gray's Family Restaurant, he said he rode a "relentless door-to door cam- paign" to victory. Standing with his wife, Karen, and their two sons, Tyler and Michael, Kinch thanked his volunteers for their tireless effort, and thanked the voters for their warmth and friendli- ness during his door-to-door campaign. "We touched thousands of Cumberland voters personally. There is no substitute for hard work. That was the difference," Kinch said. "There are some who believe that voters are distracted or even disinterested in the important issues of the day. We proved them wrong." The former Cumberland deputy police chief said he would follow through on his pledges to focus on accountability and expand citizen access to Cumberland's government. "I look forward now to working with our new mayor, my new colleagues on the Town Council, and the School Committee to make sure our govern- ment 's priorities and spending prac- tices reflect the values of our town's hardworking taxpayers," he said. In the lone School Committee race, Heidi Waters, who has children in the district, convincingly defeated David Francazio, who has no children in the district, earning 78 percent to Francazio's 21.3 percent. Other school board members, including newcomer Jennifer Bernardo running in District 3, had no opposition and won with ease. Waters had run on a promise of doing more for the local public school system her family is a party of. She replaced outgoing member Amy Goggin, who was supporting her can- didacy. No other nonpartisan school board seats had challengers this year. District 3 committee member Paul DiModica ran unopposed in seeking William Dennen's at-large seat, and Bernardo won DiModica's old seat. For Cumberland Fire Committee, former Chairman Bruce Lemois was left on the outside looking in after coming in third in his re-election bid. Incumbent Dana Jones secured the most votes, at 5,230, or 27.8 percent, while fellow incumbent Paul Santoro came in second and also earned a seat, with 4,726 votes, or 25.1 percent. Lemois followed, with 4,651 votes, or 24.7 percent, and Charles Wilk came in last, with 4,091 votes, or 21.7 per- cent. "Life is good," Lemois told The Breeze. "I'm always going to be involved." Cumberland voters on Tuesday gave incumbent Democratic Gov. Gina Raimondo 50.3 percent of the local vote, slightly less than the 52 percent she received statewide in her win over Republican Allan Fung. In addition to the four-year terms, Cumberland voters also approved all other charter change questions Tuesday, as well as more money for street repaving. LINCOLN – Incumbent Republican Sen. Thomas Paolino beat Democratic opponent Dennis Lavallee at the polls Tuesday by a margin of 1.2 percent. There were reports early on in the evening that Paolino might have lost the seat. In his bid for re-election, Paolino earned a total of 5,967 votes to Lavallee's 5,828 in the three-town dis- trict, according to the unofficial results as of press time, a difference of 139 votes. Paolino earned 50.5 percent of the vote to Lavallee's 49.3 percent. According to the State Board of Elections, Paolino had 324 mail-in ballots while Lavallee had 278. On his campaign Facebook page, Lavallee thanked "all friends and fam- ily that helped out. We came up short on votes, but not on effort," he said. "Best of luck to Sen. Paolino." 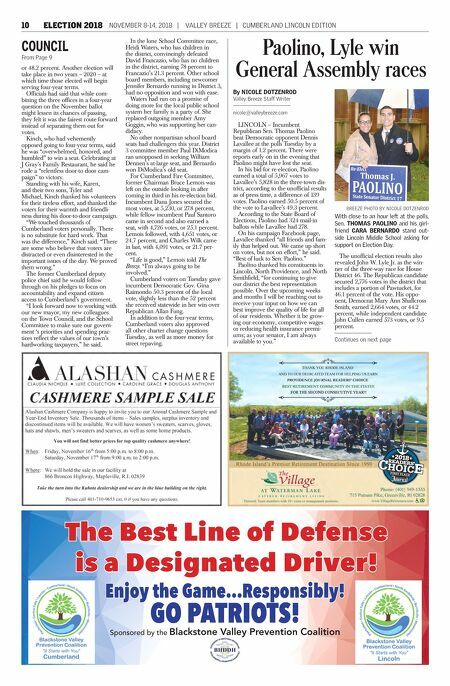 Paolino thanked his constituents in Lincoln, North Providence, and North Smithfield, "for continuing to give our district the best representation possible. Over the upcoming weeks and months I will be reaching out to receive your input on how we can best improve the quality of life for all of our residents. Whether it be grow- ing our economy, competitive wages or reducing health insurance premi- ums; as your senator, I am always available to you." The unofficial election results also revealed John W. Lyle Jr. as the win- ner of the three-way race for House District 46. The Republican candidate secured 2,776 votes in the district that includes a portion of Pawtucket, for 46.1 percent of the vote. His oppo- nent, Democrat Mary Ann Shallcross Smith, earned 2,664 votes, or 44.2 percent, while independent candidate John Cullen earned 573 votes, or 9.5 percent. Paolino, Lyle win General Assembly races By NICOLE DOTZENROD Valley Breeze Staff Writer nicole@valleybreeze.com COUNCIL From Page 9 BREEZE PHOTO BY NICOLE DOTZENROD With close to an hour left at the polls, Sen. THOMAS PAOLINO and his girl- friend CARA BERNARDO stand out- side Lincoln Middle School asking for support on Election Day. Continues on next page Sponsored by the Blackstone Valley Prevention Coalition The Best Line of Defense is a Designated Driver! Enjoy the Game…Responsibly! GO PATRIOTS!